A statement/interview with the administrators was available in the Scotland on Sunday. It may have appeared elsewhere but I did not care to investigate and more than I had to. IN THE next 24 hours, Rangers administrators Duff & Phelps believe they will reach some form of “consensus” with the Ibrox playing staff on the job and wage cuts required to plug the £1m shortfall per month to allow the club to continue running for the final three months of the season. First of all, “consensus” requires agreement. Indeed in reference to ‘contract’ -consensus in idem is the phrase of choice. The agreement can be manifested in writing, the spoken word, other conduct, or some combination of these. Now call my cynical but what in legal context may be considered ‘consensus’ does not particularly mean that a ‘take it or leave it’ offer or a ‘termination’ is widely agreeable. Nevertheless it is the only way for such to be achieved. The players, led by head of the PFA Scotland Fraser Wishart purposed a ‘deference’ arrangement to the administrators effectively making them creditors to the club. This was never a situation that would have been accepted by the Administrators of the club; nor one that they could easily enter into legally anyway due to the nature of administration. The biggest news here is that there is a £1million per MONTH shortfall for Rangers. Again, perhaps I am looking too deep into this but that would indicate to me a £12million per annum shortfall for the club. I am aware that Craig Whyte is a master of tight sentences but many a rangers fan would be under the impression that the club had a £10million per annum shortfall. Naturally, this would be an oversight: of course the season does not run for 12 months. What DOES need to be taken from this is the vast expenditure of RFC for what can only be described as, average. £1million per month is a vast amount of cash for ANY business to cut. Consider Messer’s Davis, McGregor, Whittaker reportedly sitting on salaries of £20’000 per week. Average this at £80’000 per month equalling £240’000 per month between them. A severe sum of money don’t get me wrong, but not even QUARTER of the amount required to even the clubs monthly spending. As these are the only three players at the club (Naismith aside) actually worth any sum of cash then the other costs of RFC on a monthly basis must be nothing short of phenomenal. And in the next few weeks, the administrators are optimistic they will have genuine expressions of interest from parties who want to buy Rangers, and create a future for the club in which they can see no place for current owner Craig Whyte. Any old clown could have told you that there was no place at Ibrox for Craig Whyte. Indeed you would struggle to find a place in SCOTLAND for Craig Whyte at this moment in time. Perhaps Parkhead but that would be a rather null, tongue in cheek argument. Quite who are those ‘potential buyers’ and in what format? Nothing short of a trillionaire, with endless sums of wealth and a great desire for RFC could realistically come in and wipe the deck clean. A mere millionaire will not suffice – unless they are of the Michael Carroll mould in the Euro millions rollover; but for arguments sake, let’s pretend there is no such idiot/benefactor. Consortium of wealthy fans with business acumen? Perhaps… but in Rangers current form? H.M.R.C: £15 Million P.A.Y.E contributions. (Plus £2.5 Million ‘wee’ tax case. I am uncertain as to the in’s and outs of that situation so please correct me). Another hefty debt and one that needs settled. SPL Clubs: Between Hearts, Dunfermline, Marvin Sellicks old side and Inverness (at least) there is another £2.5million let’s say, for argument sake. In total, that’s a club debt of around £45million pounds, give or take. An insurmountable level of debt for RFC. Needless to say that those figures omit any potential HMRC liability from the tribunal findings. On that basis, then – I really fail to see what the business plan would be for any potential takeover party unless they have ‘off the scale wealth’ (Where have we heard that before?). Unless they are guaranteed a 2p in the pound opportunity. These two developments could be presented as some sort of progress. Likewise, administrator Dave Whitehouse’s assertion yesterday that Rangers would avoid liquidation. Except he seemed to restrict himself to a narrow idea of the term’s meaning. To followers of the Ibrox club, liquidation amounts to the end of Rangers as constituted in 1872 and a new company formed to play out of the same stadium, with the same players but not the old history. Whitehouse wasn’t willing to give assurances on the avoidance of that. “Let’s be clear here of definitions of liquidation,” he said. “If your view of liquidation is a process of cessation of the football club we are very hopeful and confident that will not happen. In terms of the way forward, we have never discounted the possibility [of a so-called ‘new-co’ Rangers replacing the current club]. Without being condescending towards Mr Whitehouse I couldn’t voice my opinion. So I am afraid that I am going to have to be. What on EARTH is this man talking about? Let’s look at the Governments definition of liquidation shall we? As opposed to some fairy tale meaning. Liquidation is a legal process in which a liquidator is appointed to ‘wind up’ the affairs of a limited company. At the end of the process, the company ceases to exist. Liquidation does not mean that the creditors of the company will necessarily get paid. returning share capital to the shareholders if there is a surplus after repayment of all debts. When this has been done, the liquidator will apply to have the company removed from the register at Companies House and dissolved. This means it ceases to exist. A ‘new-co’ is not Rangers. It is arguably the only(realistic) way forward for the future of that club but it does not mean that you can define the term ‘liquidation’ on the back of it as a way of manipulating fan belief. Indeed, as much as I can personally see through the terminology of Mr Whitehouse I can only hope that all Rangers fans do. Sadly, having read some opinion on Facebook fan sites – they do not. Whitehouse as good as ruled out any possibility that the club will be able to meet the 31 March deadline for obtaining a licence to compete in Europe next year. Continental competition would be denied to a new-co Rangers for the first three years of their existence. Another empty statement. They wish to minimise the effect on Rangers ability to compete in European competition – yet, in the same sentence – admit that they will not meet the guidelines for Rangers to do this next season. Previously, they have referred to a ‘new-co’ that would, even if it flourished, be unable to compete in Europe for three seasons. So was there any point in the statement about minimising? Or to summarise: It would be nice to get a C.V.A but if I am brutally honest I can’t see one for the life of me – Paul Whitehouse. To boil it down, Whitehouse expects bidders despite there being no definitive about what liabilities these bidders could be committing themselves to cover. That is why, Whitehouse explained, the redundancies that will come on Monday along with wage cuts – eight players and a 35 per cent across the board salary reduction are believed to be likely – have to serve two functions. “We are looking to achieve cost savings of £1m a month to get through to the end of the season,” he said. “That’s to preserve the core business but, through any administration process, the ultimate objective is to secure the survival of the business. We have now got a significant level of interest in terms of potential purchasers. Potential purchasers for what? RFC or the assets of RFC upon liquidation? There appears to be no definitive here. Ahhhh, so not to scare off further bidders was the reason for refusing a deferral, and not the legal complexities of creating further creditors? It has emerged that a number of players have offered to play for free. Four of these, Lee McCulloch, Sasa Papac, Kirk Broadfoot and David Healy, are among those expected to have their contracts terminated on Monday, and the gesture may not be practical with issues of insurance cover. An offer to play for free, no matter your financial position in life is a good offer. I am sure that all of those men have made a good living from Glasgow Rangers or other clubs throughout their careers. A few months’ wages will hardly affect their standard of living. That is of no criticism to the players however, it is a nice gesture and one that Rangers fan will always appreciate no matter what issues may arise with regard insurance etc. to prevent it. The non-investor Rangers attracted in Whyte should become a non-person in any future dealings. There had been reports, which the administrators would not confirm, that they were to ask him to consider relinquishing his 85 per cent shareholding for no return. I will give him his £1.00 back out of my own pocket if he wishes. But he must collect it from me in person. That is all. 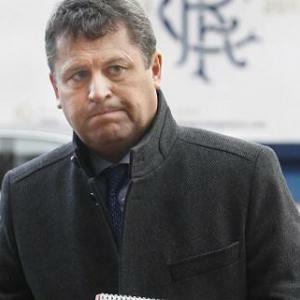 The administrators continue to investigate Whyte’s preferred creditor status and, although he holds a security over Ibrox Park and Murray Park, there is belief that, if his security doesn’t hold because he bought Rangers with the club’s own season ticket money through the Ticketus deal, then the administrators could take steps to release his security over stadium and training ground. I do not have the time to delve into previous case law and legislation regarding a situation such as this. What I will say is that if Craig Whyte were to emerge as a preferred creditor from the situation then it would be a travesty. I am always one to separate ‘morals’ from the ‘law’ but in a situation where the terms ‘morally bankrupt’ are being tossed about on a daily basis in relation to previous honers then it is perhaps jist to coin it myself. In my opinion, and it is one that I am fully entitled to: The best move for Rangers would be exactly what all those so up in arms about the situation demand. As I have alluded to on many occasions, a ‘new-co’ is the only real way forward for Glasgow Rangers. Starting as a fresh company and with a clean slate. My hope would be that much of the previous baggage dragged along by ‘Rangers fans’ would be left behind. It probably won’t be, but it would be my wish. The baggage of bigoted songs, promotion of UVF, UDA etc. organisation could only be good for Rangers Football Club. It is something that has absolutely no place in football in general and is something that holds out society back as a whole. They are not alone, but why both Rangers and Celtic fans have a burning desire at times to align themselves with organisations such as UVF, UDA, Pro-IRA is beyond me. I have no time for it in my life, is it the most pointless and pathetic political subjects to bring to football. Football should be a release from Politics and the frailties of public agreement. Vocal support of such completely diminishes everything that sportsmanship should be about. It is a cancer. Another bugbear of mine in recent weeks has been the complete abolishment of sympathy for the innocent victims of the current Rangers situation. That is not only the players that will inevitably be let go but the everyday staff of Rangers as well. The Dunfermline players that never received their full wage packet, staff from other creditors that will no doubt lose their livelihood in due course if they have not already. The ‘Jelly and Ice-Cream’ taunts to those people are both sick, and an indication of a failing as a human being. I don’t need to hear any argument of ‘ohh but suchnsuch done this in the past’ – I wouldn’t justify THEM either. There is no justification in the here and now for laughing at people whom, through no fault of their own, have to rearrange their lives whilst maintaining some stability for themselves and their family in difficult financial times. God help you if you are ever involved in such a situation yourself. I understand that people in this situation are in a minority, but you need not look far to find them. They are often the ones shouting the loudest. A special mention should perhaps be made of the fool that thought it wise to laugh at the wheelchair bound fan with a ‘we don’t do walking away’ scarf. I have a dark and sick sense of humour myself, but I know when something is appropriate and when something is socially unjust. I am not going to claim high moral ground because I would be a barefaced liar if I did. I laugh at things that perhaps I shouldn’t but I keep it private. I certainly don’t make a fool of myself by posting it on a public platform. As for Glasgow Rangers. I believe that reformation as a ‘new-co’ with application to the football league in division 3 the only way forward. I do not want the rules ‘bent’ for the sake of a TV contract. I want things to be done properly, like most Rangers fans. Behind the anger and frustration there will always lay a sense of embarrassment at Rangers actions that have come to light. It would be unnatural not to feel such. If a new company is formed, and I am going to follow that new company then I want it to be above board. If above board requires starting out life in division 3 then that is the way that it should be. It would be for the best all round, no points penalties and an opportunity to build the club over a space in time gradually – adjusting budgets were appropriate and maintaining the good stable health of the company. I feel that the other SPL clubs relay heavily on the income from Rangers through both gate receipts and T.V contracts. I can prove it easily by putting forward the simple fact that Dunfermline players wages were not paid on the strength of Rangers failing to pay their gate receipts forward. Team like Kilmarnock, Aberdeen, Dundee United and Dunfermline have outrageous levels of debt for clubs of their size and stature. Nothing but massive cuts across the board will fix that and perhaps without a reliance on cash they could address such issues. It won’t happen, I don’t think that they will get the chance to – I think they would struggle. As for Celtic, well – good luck to them. Celtic have suffered in history – indeed it is only now that most Celtic fans appreciate the frugal work started by Fergus McCann back in 1994, work that has been continued by Peter Lawwell in recent years. One must remove their ‘bunnet’ to Fergus McCann as the man that laid both the foundations and bricks of the current Celtic model. Perhaps if David Murray had followed suit then the gloating Rangers fans of the past 15 years would not be sitting with a smattering of egg on their face at the prospect of barren years ahead. I hope that all Celtic fans appreciate the work Fergus McCann done for the club. His decision to stay strong and not empty the ‘biscuit tin’ has proved to be the correct one in the long term. The man should be a hero in all Celtic fans eyes. I say should because I find myself sniggering up my sleeve at some of my Celtic supporting friends that for years lambasted Fergus for his frugal attitude. Understandable, it must not have been easy to watch their team at the time. Payday has arrived though and I am sure that it will be enjoyed. I am a humble person, so good luck in your ventures both at home and abroad. Rangers undoing is far from the fault of Celtic, I can only hope that one day we will be back as real rivals and foes – only hopefully without the damned idiot fringe and their pointless bigotry. There are currently 8 persons from Duff & Phelps within Ibrox on a pay-scale of between £250.00 and £750.00 per HOUR. Now, if you take that at a flat rate of £500.00 per hour, over an 8 hour day this is £4000.00 per person. That would equate to £32’000 per DAY on Duff & Phelps. I am of course taking a hard line on the figures and hours worked, but it is not impossible for the cost of administration to be of such significant values. This entry was posted on March 5, 2012 at 13:05 and is filed under Glasgow Rangers, Tax Case. You can subscribe via RSS 2.0 feed to this post's comments.